Nokkon Run Coaching is here. 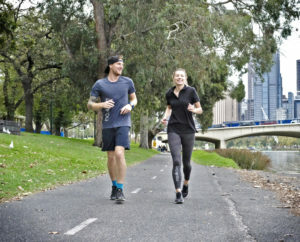 With the success of our run coaches involvement in the collaborative #Getitdone Club sessions (Facebook and Instagram), we are using our knowledge and training techniques to deliver world class run coaching services nationally and internationally. Our coaches know how it feels when you say “I can’t run”, “I hate running”, “I don’t like the way I look when I run”. They have the experience to not just have you running but enjoying it and keeping you connected. From walk/run transitioning to 5km to marathon and ultra running our coaches will be there every step alongside you, to ensure the journey is just as rewarding as reaching your goals. Our tailored programs are available worldwide and our one on one coaching is within Australia subject to availability. or … Let’s do it. Take me to payment. I was the girl who just didn’t run. When my friend who is an ultra marathon champ decided to drag me along to one of these run groups I was skeptical and expected to just plod along and do my own thing instead I was met by an incredible community of runners who encouraged me as I ran for the first time ever. 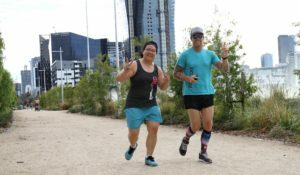 Chris spent time running along side me offering tips and suggestions to help improve my running and taught me the importance of short goals which helped me keep going. I went away from this experience with a new found love for running and while I’m still just getting started the nokkon community is still there cheering me on, through Facebook, instagram and Strava. Goes to show just how inclusive this is whether you’re starting out or looking for some pro tips to imrprove your pace. Couldn’t rate Chris and getitdone club highly enough 😊 Thanks for everything guys! Clubs are great because you can get together with like minded people and share your passion and ‘war stories’. However, Nokkon goes beyond this. They are really motivated to make you a better runner. 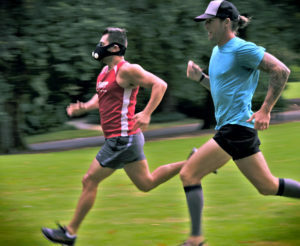 Most clubs try and get your running better by running more. But this doesn’t work, and the team at Nokkon know this. They look at developing the whole runner. By this I mean time is carefully spent on warming up, different types of running drills and thoughtful cooling down. In the warm up, various movements are shared and explained to ensure you are ready for your best ever session. When the running starts, the coach is in your ear getting you to think about form, breathing and so on. During the running session, you may be asked to get involved in other skills based routines using various apparatus to develop you strength, speed or form. Throughout these routines, a coach is right by your side helping you get the most out of using the apparatus. Always at the end, there is a well-planned cool down to help minimise injury and keep you limber for your next run. Overall, if you are looking to improve your running and ‘run big’, speak to the team at Nokkon. They won’t let you down. A few months ago I decided to take the plunge and attend my first #getitdone club session. I had heard great things about the session and so I was excited to participate & hopefully walk away with some advice and information about training and running form. The session did not disappoint! From the beginning Chris was friendly and approachable, asking me where I was currently at with my running and where I wanted to go. During the session, which was catered for all running abilities, Chris was encouraging and knew when to give me that little extra push! The session was fun, challenging, informative and inclusive. I have learnt so much and have been able to transfer so many strategies in to my own training. Chris is a knowledgeable coach who genuinely cares about you and your running. What he says just makes sense, I would highly recommend the team at Nok-kon and i can’t wait for the next session. What can I say that has not already been embodied in text above? Nokkon, not just your standard run training. It will test your strength and resilience, challenge you to question and seek answers to a “better you”. Through this movement, you will be changed, like it or not! I have been doing Crossfit for 3 years, but I cringe every time I see running as part of the workout. I have come up with every excuse in the book to avoid running. I hate running. It’s uncomfortable. I get stitches. I can’t breathe. My back hurts. I’m no good at it. Running more then 400m makes me want to cry. Deep down, I knew I needed to work on this weakness of mine, but I didn’t know where to start. Then a friend told me about the #getitdone club. I was apprehensive at first, but I put those doubts aside and went to my first session. Joining the #getitdone club was one of the better decisions I made for myself. The coaches are incredibly supportive and encouraging. At my first #getitdone session, Shaun ran with me the entire time, making sure I was okay and teaching me some running techniques and tips. The club members was made out of beginner runners like myself, to experienced ultra marathon runners. Everyone in the club were so welcoming, and I never felt out of place or left out. When the running coach program was introduced, I signed up without hesitation. I have had 2 one on one sessions with Chris, and I learnt so much from those sessions. Chris taught me the necessary skills to make running much more bearable, and now I am not hating running as much! I gain so much more confidence in my running, and have signed up for a 10km run in July 2017. If you are looking to start running, improve your running or just want to meet some new friends and run together, I highly recommend the #getitdone club.